Later this evening I’ll be gathering with the MNFoodBloggers group at Sea Change Restaurant, learning about the growing, handling, opening, and enjoying of oysters. Of course we’ll be bringing some wine along as well, so it’s a good time to review the basics of wine and oyster pairing. The old adage “what grows together goes together” is commonly bantered about in the wine world and often there is truth in it — think about the herb-rich roasted meats of Provence with a good Grenache, or Oregon Pinot Noir with Salmon. With oysters, this marriage of food and place is especially keen, for when pairing wine with briny bivalves it helps to have a wine that can balance these exquisite but distinctive flavors. 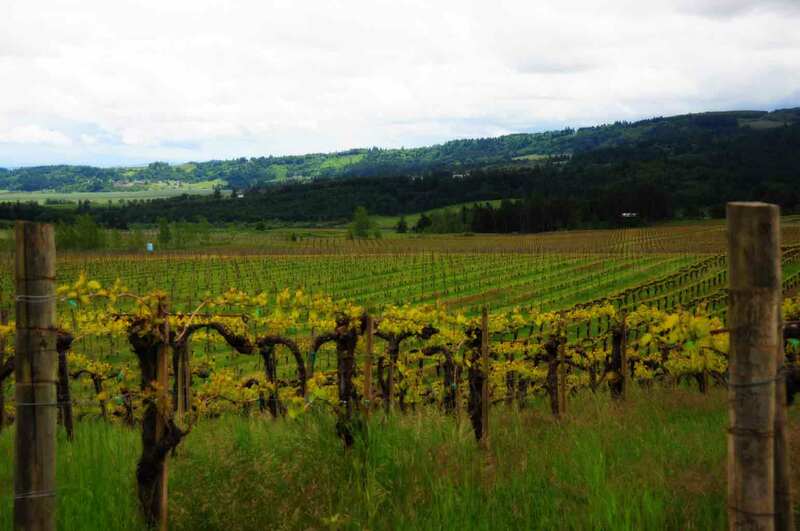 To keep this post short and sweet we’ll focus on three key regions and styles of wine. The Loire River is a grand meandering giant, originating in deep central France, initially flowing north, then taking a left turn on its way westward toward the ocean. Riding through the Loire Valley, you pass by the most opulent display of 17th century wealth you could imagine … this is an area for lovers of castles, history, and romance. As you get closer to the ocean, the geology changes and you get a whiff of sea in the air. It is here you enter the region of Muscadet. The grape in this region is Melon de Bourgogne, and it is one of the classic pairings with oysters of all types. In fact, in the Montparnasse region of Southern Paris, where some of the great oyster bars of the world are concentrated, Muscadet is often the only option for your beverage. The salinity of the air imparts itself onto the grapes, making for a fascinating back-and-forth of flavors that harmonizes like few food and wine pairings do. On the other side of France, against the Mediterranean Sea and southwest of the city of Montpellier, is the region of Picpoul de Pinet AOC. It is here the Picpoul grape makes sharp, sturdy, green-tinged and sometimes harshly acidic wines. But in the hands of a great grapegrower and winemaker, this harsh edge can be tempered and corralled, resulting in one of the most refreshing and bright white wines you can experience. Some of the vineyards of Picpoul de Pinet literally border oyster beds. In the evening, when the winds start to whip up and kick the heat of the day away, you can taste the salt in the air. Obviously, this ends up on many of the grapes and literally puts the taste of the sea into the bottle. Again, just like with Muscadet, the proximity of sea to vineyards, combined with the freshness and brightness of the wine, make for a stunning combination. Say that ten times fast (especially after a bottle of wine)! This is a region practically unknown to American wine drinkers just ten years ago, but thanks to repeated attention by the likes of Eric Asimov with The New York Times (who in 2010 wrote a particularly good article about the region) it is now in the lexicon of many. Like our first two examples, this one is all about geography. The Basque region is on the northern edge of Spain, over the mountains from Rioja. It is here that a seafood culture of amazing quality and style exists, and the citric and minerally wines of Txakolina are poured endlessly with squid, octopus, and of course oysters. 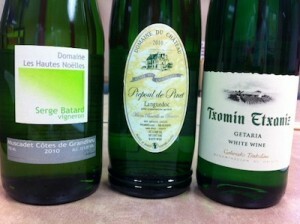 The wines pictured above are the Domaine Les Hautes Noëlles Muscadet, the Chateau de Pinet Picpoul de Pinet, and the Txomin Etxaniz Getariako Txakolina — all great examples of the regions discussed, and all imported directly by The Wine Company. They are available from Minnesota retailers (contact us to find a shop near you), or to the rest of the country through Artisan Vineyards. Check out a neat little video our own Nicholas Livingston put together on wine with oysters. The images are from one of our regular in-office oyster parties that we do a couple times a year, and you’ll see Larry, Robbin, Angela, and many others enjoying the delciousness that only oysters can bring.